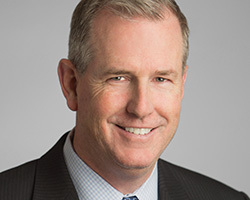 Kevin Walsh is the Chief Financial Officer of C&W Services where he oversees the controllership, financial planning and reporting, and finance operations support functions. Walsh has more than 25 years of diverse financial management and operational support experience. Prior to joining C&W Services in 2014 (formally DTZ and UGL), Walsh held CFO positions at Interpublic Group’s Hill Holliday, a leading full-service advertising firm, and the Avedis Zildjian Company, a leading manufacturer of musical instruments. He also held senior-level finance positions in Europe with Novartis and Raychem, and spent most of his early career with KPMG’s Boston office. He earned his Bachelor of Science degree in business administration from Bryant College, a certificate program from INSEAD and his MBA from the University of Chicago Booth School of Business. He is a Certified Public Accountant.